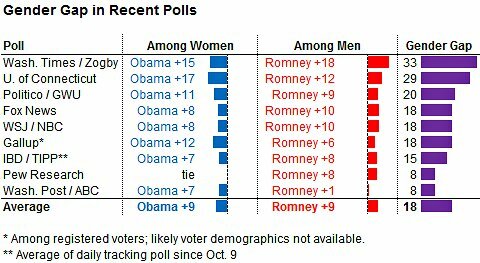 The gender gap: Women support Obama more than Romney for economic reasons. 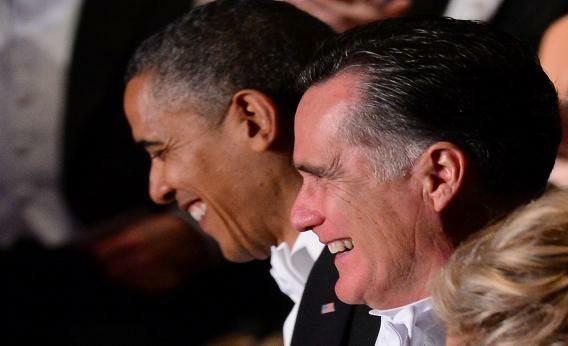 Both candiates have nice smiles. So what gives? Nate Silver at Five Thirty Eight published an analysis yesterday of the ever-present partisan gender gap, which stands at an average of 18 points across presidential election polls right now. Silver doesn’t really delve into why the gap, which persists in nearly every presidential election, is so big this year, but does mention in passing that abortion rights play a prominent role in presidential elections and that women tend to be more liberal generally. It’s tempting to imagine that men and women are fighting out who should control America’s uteruses in the polls, but the fact of the matter is that men are just as likely to be pro-choice as women. Reproductive rights as they are commonly understood by the Beltway, i.e. as a matter of abortion’s technical legality, probably have little to do with the gender gap. Indeed, this is why the Romney campaign and its surrogates routinely claim that female voters don’t care about the “war on women” and instead are focused on the economy. What they fail to grasp is the two are not mutually exclusive by any means. When, for instance, Republicans band together to vote against the Lilly Ledbetter Act, which was an unambitious bill clarifying previous anti-discrimination legislation, that’s an economic issue for women. Republicans going out of their way to try to carve out an exception in the health care law to allow employers to formally discriminate against women by refusing to cover contraception under the same guidelines the HHS uses for non-gendered preventive care like vaccines? That is ultimately an economic issue. When Mitt Romney, addressing the financial concerns of single mothers (in the process of blaming them for gun violence! ), suggests that they should find “someone” to marry rather than offering policy solutions, that’s an economic issue. Outside of the overtly sexist stances Republicans take that hurt women economically, female voters correctly perceive Romney’s general hostility to the social safety net and to the 47 percent of Americans who don’t make enough to pay federal income tax as more dangerous to women than men. Women are more likely to be on Medicaid and they tend to live longer, meaning they have more years of needing Medicare. They’re more likely to have children they’re directly responsible for and they’re more likely to turn to college education to improve their economic well-being, which means that Republican opposition to student loan reform presents more of a danger to their financial futures. The Romney campaign is absolutely right that women view jobs and the economy as the most important issues. It’s just that the majority of women don’t really believe Mitt Romney will make things better for them in that department. That’s how you get a potentially historic gender gap.